Ivan Cooper: I just want to say this to the British Government... You know what you've just done, don't you? You've destroyed the civil rights movement, and you've given the IRA the biggest victory it will ever have. All over this city tonight, young men... boys will be joining the IRA, and you will reap a whirlwind. Q: What British Army units were involved? Q: What is the attitude to Bloody Sunday today? Q: What was the situation in Londonderry/Derry? 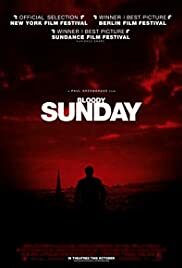 English screenwriter, producer and director Paul Greengrass' television film which he wrote, is inspired by a novel called "Eyewitness Bloody Sunday" from 1997 by Irish author Don Mullan and real events which took place on the 30th of January in 1972 in Derry, Northern Ireland. It premiered at the 18th Sundance Film Festival in 2002, was screened In competition at the 52nd Berlin International Film Festival in 2002, was shot on locations in Derry and Dublin in Ireland and is an Ireland- UK co-production which was produced by British producer Mark Redhead. It tells the story about an Irish nationalist and politician named Ivan Cooper and his fellow members of the Northern Ireland Civil Rights Association who on one Sunday in January 1972 began walking a peaceful march through the streets of Derry, Northern Ireland to demonstrate against internment without a trial, the suppression Catholics had suffered from Protestants, to end unionist rule and for equality. And the story of the members of the British Army whom the Commander of Land Forces in Northern Ireland had requested. Distinctly and engagingly directed by European filmmaker Paul Greengrass, this finely paced and somewhat fictional tale which is narrated from multiple viewpoints though mostly from the main character's point of view, draws a conscientious portrayal of a non-violent political demonstration, banned by the government of Northern Ireland, for social justice which escalated into an uncivilized riot where rocks and bricks were answered with live rounds. While notable for its distinctly naturalistic milieu depictions and use of sound, this narrative-driven story about a late 20th century conflict which happened four decades ago during the Troubles in Northern Ireland in the early 1970s where the constitutional status of Northern Ireland was, and still is, a matter of contradictory views between the Catholic community who thinks that their country should become part of a United Ireland and leave the United Kingdom and the Protestant community who thinks that their country should remain within the United Kingdom, objectively examines how events occurred during a winter day when the city of Londonderry was crowded by Irish civil rights campaigners, hooligans, civilian observers, members of the Provisional Irish Republican Army, the press and a British battalion who was there to make necessary arrests. This sociological, conversational and important reconstruction and retelling of a politically instigated historic event and unjustifiable massacre which ended with fourteen male citizens, many of them seventeen-year-old boys, losing their lives, soldiers of The First Battalion, Parachute Regiment being decorated by Queen Elizabeth II of England, an increasing amount of young men joining the paramilitary organization called the IRA and the families of those who were killed getting an official apology from the Prime Minister of the United Kingdom David Cameron thirty-eight years later, is impelled and reinforced by its cogent narrative structure, interrelated viewpoints, vital atmosphere, timely and distinct editing by British film editor Clare Douglas and the prominent acting performance by Irish television and film actor James Nesbitt. An authentic, truthful and reverent documentary drama from the early 2000s which gained, among numerous other awards, the Golden Bear tied with Japanese filmmaker Hayao Miyazaki's "Spirited Away" (2001) at the 52nd Berlin Film Festival in 2002.